I wrote the following post last year, and since I’m still inspired by the life, courage, dedication, and perseverance of William Wilberforce, I wanted to share it again today. I hope you too will be inspired by this great man . . . The early morning of February 24, 1807, was a great moment in history. After a long and difficult struggle to abolish the British slave trade, William Wilberforce’s goal was finally realized! Here is a glimpse back into that day . . .
At 4am, on February 24, 1807, the House of Commons voted by 283 to 16 for the second reading of a bill to abolish the British slave trade. In an almost unprecedented gesture, nearly the entire house rose to cheer one of its members who, for two decades, had been ignored, abused or violently opposed for making the promotion of this measure his life’s work. William Wilberforce, the Yorkshire MP, was “completely overpowered by my feelings” and sat with tears streaming down his face. His campaign had been extraordinary. He made himself perhaps the most influential back-bencher in British parliamentary history. A remarkable man espoused a great cause to the point of obsession, and thereby achieved greatness for himself. That quote is from an article that was written in 2007, reviewing William Hague’s biography of William Wilberforce entitled, William Wilberforce: The Life of the Great Anti-Slave Trade Campaigner. What a moving scene that must have been. It makes me feel like cheering and crying all at the same time just thinking about it! 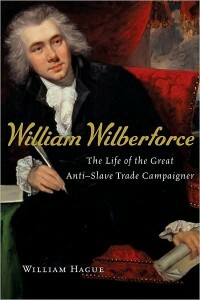 It took twenty years of hard work before Wilberforce and his fellow abolitionists saw the abolition of the British slave trade, but they had to wait another twenty-six years before they would see the abolition of slavery itself in the British empire, three days before William Wilberforce died in 1833. What a commitment he had to spend his life working so hard to abolish slavery! Sadly, slavery still goes on today. In fact, there are more slaves today than at any other time in history. And yet, there are also many people and organizations working to end modern-day slavery with the same tireless commitment that Wilberforce had! For more great books and resources about William Wilberforce, see my other posts about him, and check out this article from a few years ago to learn a little more about modern-day slavery, as well as William Wilberforce and the movie about his life, Amazing Grace. I read this book last year and thought it was toooooo long. It was great to learn a lot about the great William Wilberforce but there were just some chapters that didn’t seem to be even needed. I did enjoy learning though about all the toils and troubles of him standing up for his beliefs. Hi Victoria! Thanks so much for your comment! It’s so great to hear from you again :). I must admit that I haven’t even read this whole book yet, I’ve only read the beginning. My favorite William Wilberforce book, and the first one I read about him, is ‘Amazing Grace’ by Eric Metaxas. Have you read that one?